This fine example of George III creamware was produced in England during the last quarter of the 1700s. It was then shipped to Holland for its hand-painted Jesuit style decoration in the typical en grisaille black and white palette. We see an Old Testament scene; these biblical depictions were very fashionable during this period. The scene depicts 1 Samuel 10-1. Samuel anoints Saul. Then Samuel took a vial of oil, and poured it upon his head, and kissed him, and said 'is it not because the Lord hath anointed thee to be captain over his inheritance'. There is no makers mark to the base as was common with creamware but there is a rectangular Tom Walford collection label. 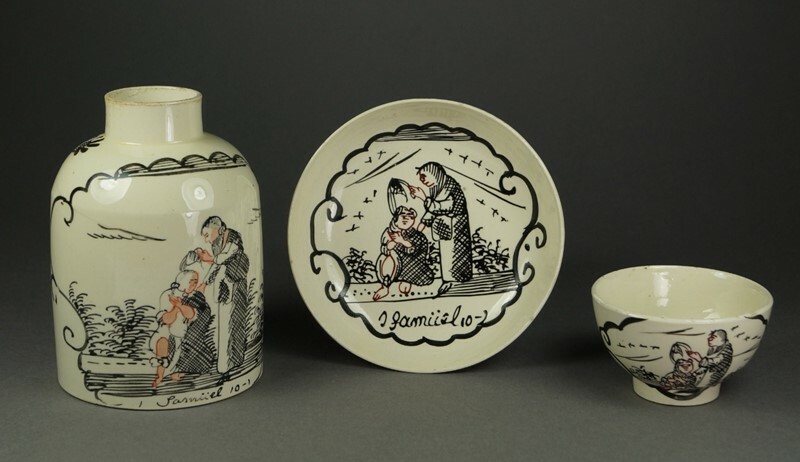 Tom Walford was one of the major British collectors of early British pottery, he particularly adored creamware. This is part of his single owner collection that was sold at Bonhams in December 2012. Measuring: Tea bowl diameter 2 5/8 inch (6.5 cm) by height 1 5/8 inch (4 cm). Saucer diameter 4.25 inch (10.5 cm) by height 1 1/8 inch (3 cm). Condition: There is a firing fault to the interior of the tea bowl where the cream glaze has not taken, there are some patches to the rim where the glaze has not taken. Please expect some minor imperfections to these 200 year old plus pieces of early Creamware. The tea canister shown in the final image is from the same collection and is retailed separately.